Here are some images from my visit on October 25, 2008. More correctly called the Borough Church of Norfolk, St. Paul's stands in the middle of a delightfully treed churchyard in downtown Norfolk. In fact, during most seasons, the church's original plan is difficult to discern due to later additions and the presence of trees that obscure the original church, making it especially troublesome to discover clear vistas for photographs. The original, cruciform church is laid in Flemish bond with glazed headers above and English bond below the water table. In the east transept, the chancel end, the water table is virtually at ground level while it seems to be about four bricks on the other walls with a beveled border throughout. The church is a large one: it is 86'6" east-west by 64'6" with walls approximately 30" thick. This original building is notable symmetrical, creating an almost perfect Latin cross (look on Google Earth to see this demonstrated.). The chancel is 18'6" long while each arm is 18'6" long. The nave is 33' wide wile each transept is 26'3" side. The nave itself is 42' long. 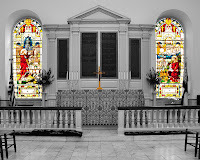 Remember that Virginia's colonial churches took on the cruciform shape not due to its symbolism but rather to the need to seat more parishioners within earshot of the pulpit. Here are images of Little Fork Church taken on July 2, 2008. Sometimes, expectations are less than reality. I presumed this church would resemble the overall setting of Lamb's Creek Church, and it does structurally, but the superb restoration and pastoral churchyard of Little Fork Church result in a total greater than the sum of its parts. 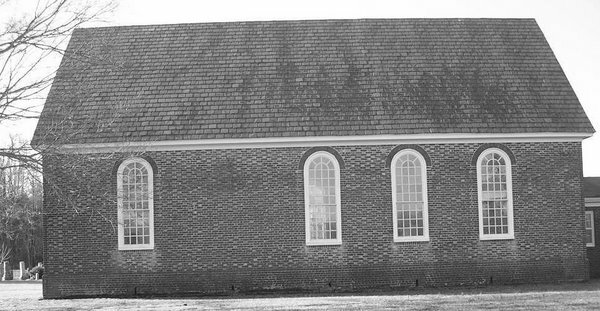 This large (83 1/2' x 33 1/2') edifice stands on a small rise of ground off of Route 229 between Culpeper and Warrenton, Virginia that retains true colonial charm like few churches in the state. 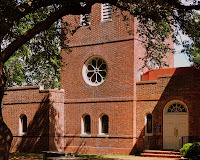 It is considered to be a transitional church of late construction, begun in 1773 and completed in 1776, having characteristics of a rectangular church combined with the contemporary, two story churches of Northern Virginia in a geographic swath from Falls Church to St. Paul's, King George County. It retains elements such as orientation, south and west doorways, compass windows, and Flemish bond, yet includes elements such as a deep church configuration, a hipped roof, movement of southern door to the center of the southern wall, classical door pediments, and a pulpit on the northern wall opposite the southern doorway. It lacks elements of deep churches in Northern Virginia such as two tiered windows and cruciform structure. Unlike most colonial churches, the designer and builder, John Ariss (circa 1725-1799) is known and designed another similar church Lamb's Creek Church that is s twin of this building. It replaces a wooden church built on or near the same site that burned to the ground in 1773. Instead of another wooden church, apparently planned by Edmund Bass who was paid five pounds for his work, this brick edifice was erected. The church site brochure cites William Phillips as the builder (for a fee of 35,000 pounds) and John Voss as the designer. It derives its name from the junction of the Hazel and Rappahannock Rivers that are nearby. The name recorded on some plats like the USGS topographical maps of Oak Shade Church has no validity. 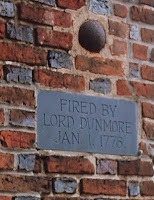 The bricks are laid in Flemish bond both in the water table and the walls and show occasional use of glazed brick in both headers and stretchers. The walls are 22" thick. Queen closers and rubbed brick are present at the corners, compass windows, and doorways. The transition from the water table to the walls is via an ovolo, or convex, molded brick. It is a large, deep church as already stated, approaching the limit of audibility in its 83 foot length. The modillion cornice, large toothed decorated eaves, are probably of colonial origin. The interior, destroyed during the Civil War for Union Cavalry firewood, was restored in 1871 and 1976. The last restoration was done under the supervision of William Griggs, a noted historical architect, and is a painstakingly accurate restoration of the original interior. It consists of box pews painted colonial blue-green with dark wood tops, the original reredos on the eastern wall, and a reader's lectern under the "wine-glass" pulpit high on the north-central wall, directly opposite the southern doorway. 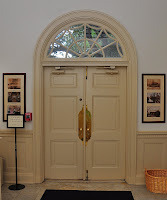 In 1963, Rawlings reports a plaster line indication that the original wainscoting was taller than that installed in the nineteenth century restoration. This is apparently corrected in the recent repairs. The elaborate reredos contains a central tablet bearing the Lord's Prayer, the Decalogue, and the Apostles' Creed in modern gold lettering on a black background. The cornice and cross are modern additions rather than colonial features. 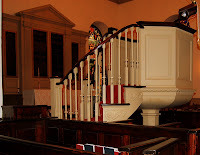 It is mentioned in the church website that the box pews were constructed to keep out winter drafts, and that parishioners used foot warmers during winters. The flat wooden ceiling is a restoration as are most of the floorboards; Rawlings believes the floor level was originally lower. The windows are of typical compass style with round arches of voissiors, rubbed brick, and queen closers. They are 8' 8" tall. There are ten windows in all. Those on the south, east, and north are identical while those on the west wall are small rectangular openings with flat arches, characteristic of openings for galleries in other churches. There is no evidence for a western gallery in this church (as in its sister church, Lamb's Creek, that lacks the western windows entirely). 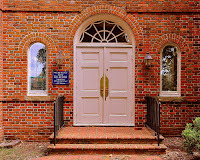 The doorways are most likely not the original form: the church probably had classical pediments like Pohick Church or Lamb's Creek Church as evidenced by brick repairs surrounding the doors. 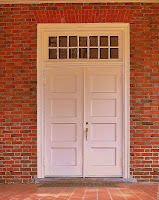 The original door openings were approximately 6' 7" wide, and the southern entrance was probably the main one. Historically, the building was used as a drill field for the Little Fork Rangers, Co. D, 4th Virginia Cavalry in 1861 and, as already mentioned, a stable for Union cavalry in 1863 when the interior was destroyed. A "contrite Union officer" reputedly sent $100 to the church after the war to replace the destroyed pews. A marble monument to the Little Fork Rangers stands south east of the church and an apparently modern sun dial is placed on a brick base in front of the southern approach. There are no colonial graves near the present church, although there seems to be the start of a contemporary memorial garden cemetery to the east of the building among a copse of small trees. Small cedar trees sporadically surround the church that is embellished by a beautifully kept lawn encircling it. In summary, the church is placed in a charming setting and has been lovingly and accurately restored to reflect its colonial heritage. Rawlings, always the objective historian, reports: "Although as an architectural monument it is without a superior in . . . [nearby] counties . . . it is one of the two or three most neglected of our colonial churches. " The recent restoration seems to have corrected all of this, and like many other of these significant buildings, it is encouraging to see Little Fork Church not only correctly restored but in active use by a congregation. As a last impression, the brick work on this church is simple splendid; in the morning light, the various hues of the individual bricks, accentuated by the rubbed brick doorways, windows, and corners are indescribably captivating. Here is a crude architectural diagram of the church based on the chart. For a far more professional diagram see Upton page 67.